Many people still rely on Microsoft Outlook as their day to day client and while we are confident that WebApp and DeskApp should be the client of choice with Kopano, we also strive to make users happy, that still want to keep working with Outlook. Out of this need we created the Kopano OL Extension (KOE), which is now available as the final version 1.3. With a growing amount of users for KOE we also had a growing number of reported crashes during useage of Outlook. While we initially suspected that Outlook was simply misbehaving during on low memory situations a more thorough investigation revealed two problems related to unreleased COM objects and the MailEvents handler, which we use to detect modifications of contacts in the GAB. You can find a more in depth description in the related JIRA issue. These improvements have previously also been released as an updated 1.2 release with the version number 1.2.127. This probably has been the most requested feature since we have started to work on KOE. By default Outlook is only able to synchronise a single contact folder (the default contact folder of any profile), while in office environments its very common to work with multiple contact folders (either in a single mailbox or as a shared folder). 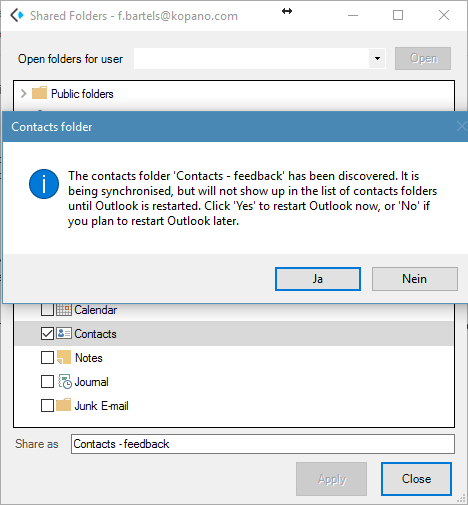 The implementation of this specific feature requires that the user once restarts Outlook to have the contact folder showing up in the contacts context, since changes unfortunately cannot not be picked up on the fly. 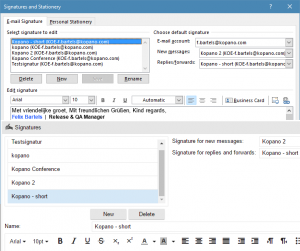 Kopano WebApp already has the ability to easily define server side signatures (even including templating functionality to simplify rollout to multiple users). 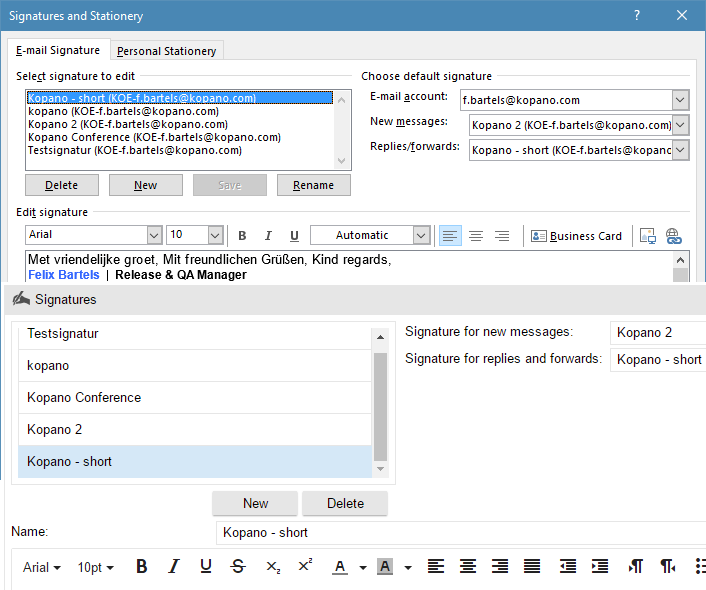 Thanks to a newly implemented webservice functionality in Z-Push 2.3.5 KOE is now able to retrieve signatures from the Kopano WebApp settings of your user, replace any given template variables of your local GAB and if you don’t already have a default signature set in Outlook, set the same signatures for new emails and replies. To prevent naming collisions we add a KOE tag to each downloaded signature. Hint: the just downloaded signatures will only be set as default, if the user did not already has set a signature on his own. You can select “override local signature” in the Kopano OL Extension settings to still set the signature. One of the downsides of synchronising multiple calendars into a single store is that Outlook by default can only set different notification settings per store, but not per folder. While in some scenarios reminders on additionally opened calendars can be desired, no one wants to receive all of the notifications your college has set in his or her calendar. Therefore we now give you the ability to actively enable reminders (off by default) when opening shared folders and KOE under the hood makes sure that the according searchfolder gets updated properly. Please note: already opened calendars will automatically updated to not show reminders. The last big improvement to be mentioned is that we now distribute KOE in three binary forms. The “old” installer (suitable for 32bit and 64bit environments) has been renamed to “combined” (e.g. KopanoOLExtension-1.3.131-combined.exe) and will continue to be the main installation package. For customers seeking to deploy KOE through GPO we have added two new msi based installation packages. KOE-62 – Improved security by enabling tls 1.2 and 1.2 for connections between KOE and Z-Push. KOE-50 – Display a warning message, if the user did not store his password in the outlook profile (as it is required for KOE to fully work). KOE-67 – Do not attempt connection to Z-Push, while Outlook is switched to “working offline”. KOE-51 – The plugin now picks up server side renames of shared folders and will rename the folder locally after the next update of the shared folders. KOE-44 – Sometimes the plugin was still deactivated during startup, we now have set the plugin resiliency in additional locations. Since the final we worked on some minor issues that came up during the beta test. Apart of fixing the styling of the msi installer, we improved the restart of Outlook after adding a contact folder, so that outlook will automatically choose the same profile as used earlier. For the signature templating we reviewed and fixed the assigned values (e.g. “%title”, should be “jobtitle” and not “title”) and restored the DeviceID in the debug dialogue. The Kopano OL Extension can be downloaded from the Kopano portal. You can find more detailed setup instructions in the Kopano Knowledge Base. To use all functionality of KOE you need at least Z-Push 2.3.5, we recommend to use the Z-Push package repositories to easily stay up to date.